January 15,2016 my wife Gaynell and I loaded up our car with a few select computers from our Bugbook Computer Museum and headed for Roswell, Georgia. 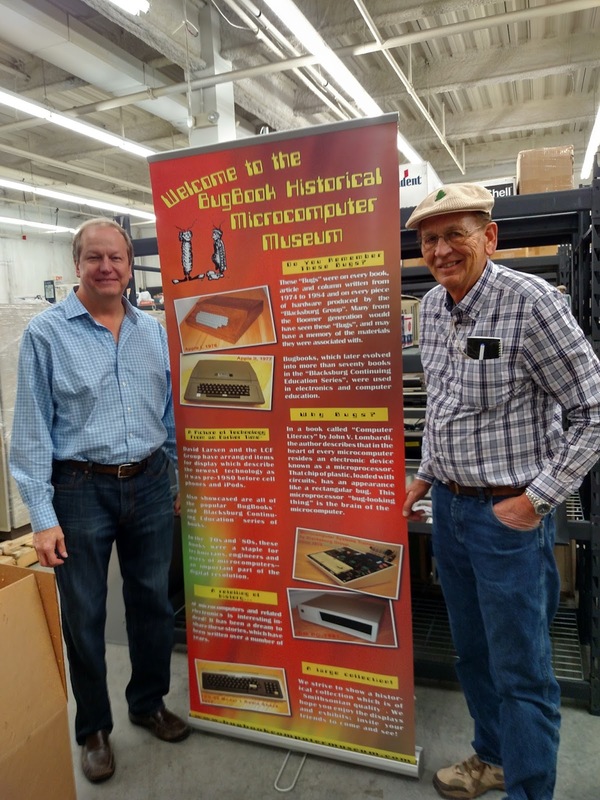 We made this trip to meet with Lonnie Mimms owner & curator of the Computer Museum of America. Our visit was to complete the final planning to move the entire Bugbook Historical Microcomputer Museum collection to the Computer Museum of America. 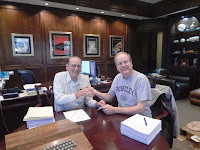 I have been looking for a good home for the microcomputer memorabilia collection collected during the past 45 years. I did not see a way for the collection to carry on in a useful way here in Floyd, Virginia after I stop kicking dirt above ground. Moving the collection to the Computer Museum of America is just a great opportunity to have the collection live into the future. I am very excited for the new home not only the computer collection - any and all historical electronic equipment I have will be part of the move. Some of the additional items moving to the Computer Museum of America are my vintage ham radio collection, vintage radio tube collection, calculator collection, Edison light bulbs and assorted vintage test equipment and old signage used by electronic and computer stores. The moving trucks will be picking up the computer collection in Floyd, Virginia next week. Here we are at Lonnie Mimms Computer Museum of America warehouse unloading the computers brought with us from the Bugbook Computer Museum in Floyd, Virginia. These are the computers delivered today. Here is my John Burch original Apple-1 computer purchased 21 years ago. This is a beautiful example of the first Apple computers and is listed as #13 on the Willegal Apple-1 Registry. The second original - a "Dustin" Apple-1 computer will be delivered at a later date. The John Burch Apple-1 computer was delivered direct to Lonnie's office. SCELBI H8 microcomputer first available in March of 1974. Only about 200 kits and computers were produced and 10 or so are still in existence. Original SCELBI computers are rare this one has a video card in is in an interesting wood case/rack with a keyboard. Super Jolt microcomputer designed by Ray Holt. Only about 5,000 of these computers were made and sold in 1975. The Jolt computers are rare example of a very functional microcomputer prior to the Apple-1. Ray will be giving a talk at the VCSE in April. Intellec 4 - Intel development microcomputer system for the Intel 4004 microprocessor chip. The 4004 was the first commercial microprocessor chip and was first available November 1970. An Intel Intellec 8 (8008 microprocessor) development system also delivered. Here is detail video about this Intel computer "CLICK"
This is a pre Intel Intellec 8 for use as a development and engineering microcomputer using the Intel 8008 microprocessor this one dated 1972 from Intel. This one was purchase for me by my friend Robert Stone 36 years ago in 1980 at one of the surplus electronic parts houses in Silicon Valley. Here is my video about this Intel Computer "CLICK"
The Altair 680 was a product of Ed Roberts at MITS after he designed the famous first complete ( all parts including case to build 8080)microcomputer in January 1975 - the MITS Altair 8800. The Altair 680 was not very popular. The 680 microcomputer used the Motorola 6800 series of microprocessor chips. Here is my video about this Altair 680 Computer "CLICK"
The Intercept Jr tutorial system is an interesting microcomputer trainer that can execute the PDP-8 minicomputer code. The design uses the Intersil IM6100 CMOS 12 bit microprocessor. The idea of using the old PDP-8 code turned out to be a poor idea in 1976 and the computer and the IM6100 were never very popular. It is a good example of using a minicomputer chip/code to sell a microcomputer. It turned out to be a bad idea as mini computers were in a death spiral and never had a recovery. More information about the Intercept in my blog "CLICK"
The MARK-8 microcomputer designed in 1974 and published as a construction article by Jon Titus in July 1974. The computer used the 8008 and came with no software - this was a real do-it-yourself project. About 200 board kits were sold without any parts - you had to obtain the parts on your own. This was a difficult project and not very many MARK-8 computer were actually completed and operational. Here is my video about this Titus MARK-8 Computer "CLICK"
A MARK-8 computer made as an exact copy of the first MARK-8 made by Jon Titus as it resides in the Smithsonian. Jon gets a lot of credit for designing one of the first microcomputers and the first construction article - How to build your own computer published in Radio Electronic July 1974. This computer was made by Roy Justus. Roy was a student of mine at VT in the early 70's. He did a beautiful job building the an making the case and this fully functional computer. Two additional MARK-8 computers were part of this delivery. Here is my video about this MARK-8 Computer "CLICK"
The Mark-80 MD-1 - another Jon Titus computer made for the educational and engineering market. The computer was sold for our group by E & L Instruments in Derby , CT. This was Jon's first computer at Tycon in Blacksburg, Virginia. It was complicated with 3 cards and a mother board. The computer used the 8080 microprocessor. This is one of 10 prototype Mini-Micro MMD-1 (8080) microcomputers made after the MD-1 in the above photo. This computer in the final design show below was very popular as a training and engineering aid for about 13 years from 1977 to 1990. This is another computer designed by Jon Titus while at Tycon (Blacksburg Group) and sold for us by E & L Instruments. Here is my blog detail about this MMD-1 and the one below "CLICK"
The commercial version of the MMD-1 above. There were a number of thousands sold. 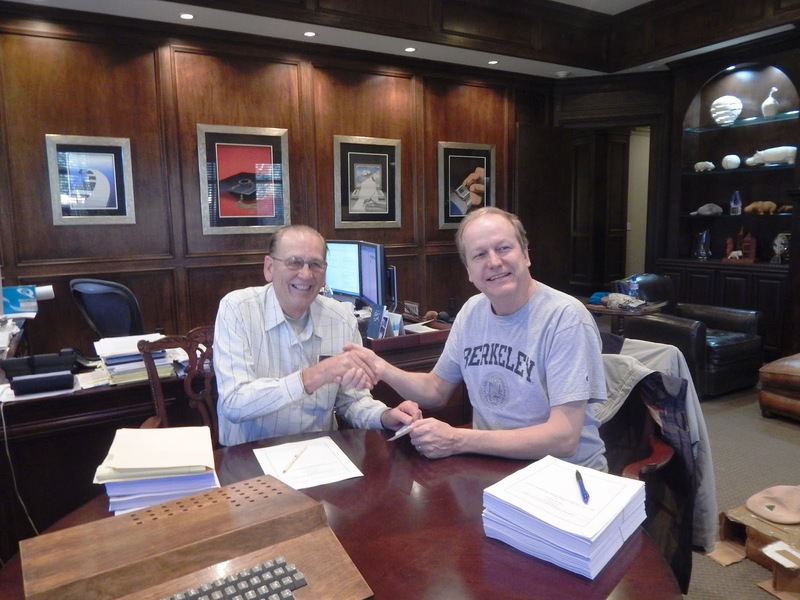 It was a good producer of royalties for the Blacksburg Group. We brought one of the storyboards from the bugbook Computer Museum. We have more storyboards however the car was full. 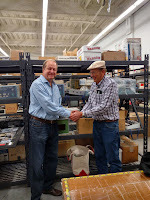 It was a delight to make this very small first delivery of computers to the Computer Museum of America. Lonnie Mimms on the left Curator of the Computer Museum of Americal. David Larsen on the right Curator of the Bugbook Computer Musuem. 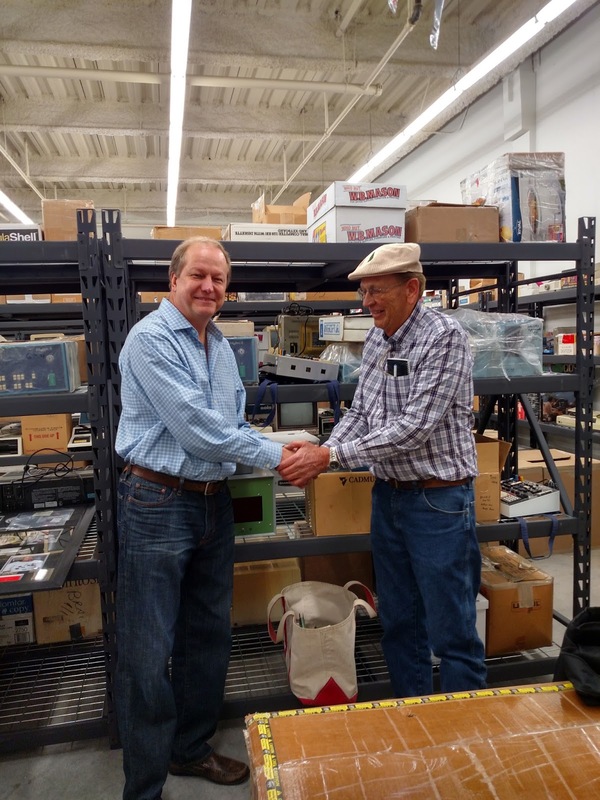 The visit to the Computer Museum of America and meeting with Lonnie and his wife Karin were a real delight. The entire staff at the Bugbook Computer Museum is excited to have our collection move to the world class "Computer Museum of America". I will still be involved by continuing to write this blog. Thank you Lonnie Mimms and your staff for this wonderful opportunity.